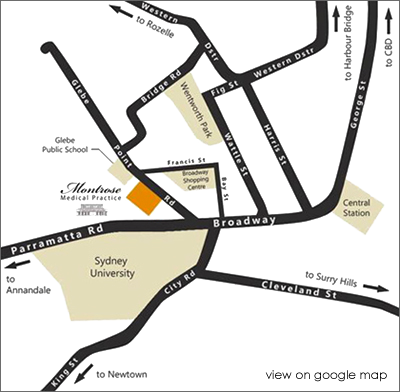 Montrose Medical Practice is near the corner of Glebe Point Road and Parramatta Road. Bus routes 431, 432, 433, 434 and 370 stop at the Glebe Point Road just steps away from us. Metered street parking is available along Glebe Point Road and off streets. Free parking is available at the Broadway Shopping Centre for 2 hours.